The son of a Texas oilfield worker, the man born Jiles P. Richardson grew up with the nickname "Jape" (due to his first two initials) and dreamed of becoming a lawyer, enrolling at Lamar College. A natural musician, he also hosted a country music show on Beaumont's KTRM; when that station hired him fulltime, his college dreams were immediately pushed aside. After getting the afternoon slot, Richardson decided to pursue a rock format, retooling himself as "The Big Bopper" to capitalize on the latest slang and to match his imposing physical frame. Like many influential DJs of his time, Richardson also got into other areas of the business, penning a song called "White Lightning" that George Jones would eventually take to #1, and another song, "Running Bear," that he recorded with Johnny Preston (the "Indian" background chanting is done by Richardson and Jones). Yet only when Mercury PR man Harold "Pappy" Daily took interest in Jape did he think of becoming a recording artist. His first hit was his biggest: "Chantilly Lace," a salacious one-sided phone call that rocketed up the charts. 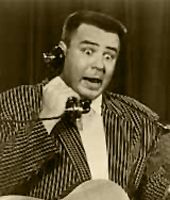 Soon, the Big Bopper was a star. Richardson joined up with Buddy Holly, Ritchie Valens, and Dion and the Belmonts for a miserable "Winter Dance Party" tour that found the musicians practically freezing to death in their tour bus. After a gig in Clear Lake, IA, Holly decided to charter a warm plane to get to their next gig in Duluth, MN; Richardson, who had come down with the flu, petitioned Waylon Jennings (a then-unknown in Holly's band) for his seat. The plane crashed, killing everyone aboard. Richardson had written 20 more songs to record, and had also made plans to invest heavily in what he saw as the future of the business -- music videos. Actress/bombshell Jayne Mansfield recorded an "answer song" to "Chantilly Lace" entitled "That Makes It"
Other important recordings: "Big Bopper's Wedding," "Little Red Riding Hood," "Walking Through My Dreams," "Beggar To A King," "Crazy Blues," "White Lightnin'," "Bopper's Boogie Woogie," "That's What I'm Talking About," "Pink Petticoats," "Monkey Song (You Made A Monkey Out Of Me)," "It's The Truth, Ruth" "Preacher And The Bear," "Someone Watching Over You," "Old Maid," "Strange Kisses," "The Clock," "Purple People Eater Meets The Witch Doctor," "Teenage Moon"